OLD PARKED CARS. : 1975 Plymouth Trailduster Sport. I've been waiting for you guys to find one of these. I've also been waiting for this to happen. It's even more difficult to find a model from the first couple years with Plymouth across the grille. Great find. Good find. These have a badass vibe about them shared in a crazy badass way is an IH product from this period. This calls for a 1975 Scout II find! Hey Frank type Scout into the search on this blog and you'll find all the Scouts they added. I have to edit my previous comment, that grille was from 1974-77. Good find. These were pretty rare. Good shot on photo #3. WHAT!?!? This is insane! I didn't even know these existed. What could it possibly mean? How many years did Plymouth make these? 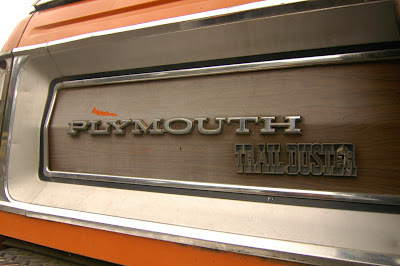 Did Plymouth actually make them? Or were they made by someone else and simply re-badged by Plymouth? Great Oden's septor! Now you need to find a Fargo. My next-door-neighbors plumbers psychiatrist had one of these. It also had chrome roof-sticks and spinning, white, rubber holders as well. It was only driven to and from the insane-asylum. Thank You. 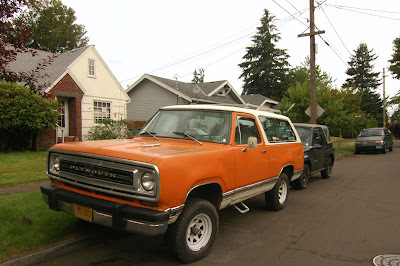 @Dad/Mark: They came down the same line, using almost all the same parts, as the Dodge Ramcharger. So instead of putting Dodge badges on it, the same Chrysler Corp workers put Plymouth badges on it. It was produced from 1974 until 1981. Chrysler Corp also added vans to the Plymouth Division lineup in the 70s, introducing the Voyager name before it graced the minivan starting in the 80s. Those, too, were basically Dodge vans with Plymouth identification on them. Keep in mind that, other than the Prowler, Plymouth didn't get a single model that wasn't platform-shared with Dodge after the 2nd-generation Barracuda. Spiff - Thanks for that. Very helpful. I would say even Ramchargers from this period are pretty few and far between. great find and an awesome truck. i'd much rather drive this than a warmed over ramcharger. 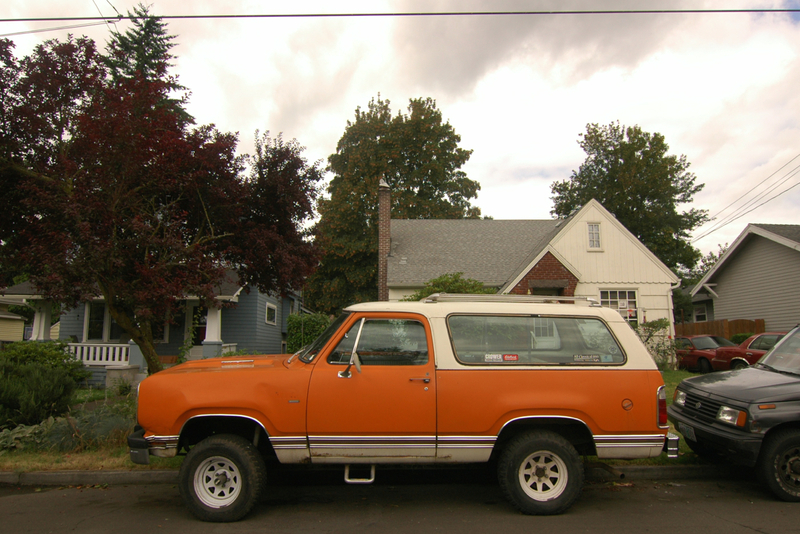 the white wagon wheels and orange paint remind me of a dreamsicle, which is what i'd name this if i owned it. Would definitely take this over a Ramcharger. There's a Trailduster parked on the side of the road in Dawn of the Dead (1978). my, my, what a beautiful rig. it is special to find the Plymouth version even though the differences are subtle from the ramcharger. the wagon wheels are cool but imo the wheels that looked the best on these trucks were the slotted rallies with the poverty caps like the one the owner has on the rack in the back. pair those with some nice big meats and this truck would be perfection. @Spiff: Thanks for the info! nearly bought one in '79. But he chose to buy a Dodge 4X4 shortbed pickup instead. I always thought that he'd been better off buying one of these. @Captaingizmo: This with a 440 would be awesome. today, but back then, at least to me, that seemed like a small fortune! My best friend back in NY had an 80-something Ramcharger in the late 80's/early 90's. 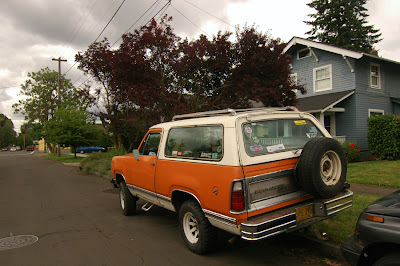 That was a fun truck...when it wasn't busted...which seemed to be about every other day.... Any time I talk to anyone from those days, the question "Remember Erick's Ramcharger?" always comes up! truck for a song! See ya' later gotta get some work done! Cap'n, all them 80's Chrysler products BELONG in the crush! -and I helped put lots of them in the crusher back when I had my tow-truck :D Seemed like better than 50% of my junk car business was hauling Mopars away for grateful owners! (Well...Mopars and Renaults!) Remember Dodge Dynastys? BWAHAhahahahaha!!!! I pushed it into a parking space! @captaingizmo: $1,500 30 years ago is equal to paying $3,500 now! Restored ones don't even go for that much on ebay! Dad took home a '59 De Soto ragtop that night for just $800.00, and it ran! dang, i was sure i'd dropped a comment on this. looks like it's been lifted a little, but the wheel size seems about right? Good to see I'm not the only one that likes to see these old vehicles fixed up.